RECENTLY REFURNISHED! The Pedrera apartment in Barcelona is situated in Rambla Catalunya, a smart boulevard lined with boutiques and outdoor cafés. Fashionably decorated throughout, It can comfortably accommodate 6 people. This modern and stylish apartment is extremely well lit. It features a large window in the lounge which has a sliding partition door separating it from the bedroom. It has all brand new modern amenities including a fully equipped kitchen. This apartment is perfect for a family or group of friends. the apartment was great! Spacious and clean, well-equipped. The only thing I would improve is the lack of air freshener and not enough toilet paper. The welcome package with one tea per person was too modest too considering the price.- Habitat Apartments reply: First of all thank you very much for the time you have taken to qualify us and tell us about your pleasant experience with us, we will take into account your data and compliance to improve our service and quality. We hope to see you again. Thank you! Everything from check-in to our four day stay was great! The AC and WiFi all worked beautifully. The beds were extremely comfortable and all was in walking distance. A truly great stay and I would recommend it to anyone looking to stay in barcelona. The area was also beautiful, safe, and centrally located. Pros. Excellent location of apartment. Beds are comfortable Apt. was very clean. Close to many restaurants and easy access to touristic sites. Cons Upon our arrival Ramon was clearly in a rush to give instructions and leave. A lot of noise from street for front bedroom. TV remote batteries were dead. Needed clearer instruction in English for clothing washer In all, good place, would recommend to others. The apartment Pedrera is located in Rambla Catalunya area. The Pedrera Barcelona apartment is situated on Rambla Catalunya, the elegant continuation of the famous Ramblas. Lined with imposing turn-of-the-century mansions, chic boutiques and outdoor cafes. The street is at the centre of the upmarket Eixample district. Here, you’ll find a huge choice of traditional tapas bars and quality restaurants, as well as art galleries and delicatessens. The apartment is one block away from Passeig de Gracia, the city’s most prestigious shopping street and home to two of Barcelona’s architectural gems: La Pedrera and Casa Batllo, both by Antoni Gaudi. Metro stop - 317 m.
Metro stop - 465 m.
La Pedrera - 0.26 km. Casa Batlló - 0.48 km. Paseo de Gracia - 0.51 km. Mooi appartement in centrum Barcelona , je kunt lopend de stad ontdekken. Terras in de buurt . Appartement is top. Enigste minpunt is de twee eenpersoonsbedden op kleine kamer . The apartment was great and the location the best. Right location and easy access to all of the shopping, restaurants and nightlife. Best deal for this apartment ever and with 2 bedrooms made it great and easy stay. Would highly recommend for any travelers and have already shared information with my friends who are planning their trip to Barcelona.. The appartment was very well situated, you stepped out to all the restaurants , walking distance from the subway, in the middle of the beautiful shopping area, of the main points of interest. The flat is very well equipped, very clean and confortable. The check - in agent was very helpful, kind and efficient, and so was the company by answering mails very promptly during my stay. I would highly recommend it. El apartamento responde exactamente a las fotos, es amplio y moderno y está bien situado. Falta no obstante ofrecer algunos detalles que se agradecen a la llegada, especialmente cuando llegas de noche (una botella de agua al menos!, o algo de fruta), y cuestiones básicas como suficiente papel higiénico o servilletas . la habitación interior es muy tranquila, aunque la que da hacia la Rambla de Cataluña es algo ruidosa. La atención a la llegada fue puntual y sin problemas. The apartment was excellent; very comfortable and clean with modern fixtures. We really appreciated having a washing machine. The bed and bed linens were very comfortable as well. The building felt secure and the location of the apartment was unbeatable. Cafes and shopping at our doorstep and an easy walk to many of the highlights of Barcelona such as the Gothic area and the Gaudi residences. The proximity of the apartment to the Place de Catalunya made airport transportation easy. I would highly recommend Pedera Apartment. Location was great, well furnished and good amenities. Some of the lights in the main bedroom didn't work, but otherwise all great. Perfect for families. All the staff at Habitat have been so efficient, as we were originally staying in a different Apartment. We stayed here for 4 nights and definitely recommend this apartment. We arrived half hour later than arranged due to long queues at airport but were still met at the apartment by a friendly girl Aina who spoke very good English. The apartment is in good condition and was very clean. The location is excellent - lots of great places to eat or enjoy a drink right outside the door, easy walk for catching transport, shopping and sightseeing. Beds were comfortable and we had plenty of room. Very nice appartment, great location. Water was not very warm in the shower. The rest was great. Nevertheless if we would go back to Barcelona then we would for sure book this appartment again. Habitat comments: Dear Paul, we are satisfied yo read that you enjoyed your stay with us and the apartment. Many thanks for your remark about the water in the bathroom, we managed to fix the problem. Best regards. Location, location, location. It was perfect for us. In the middle of everything and a very safe neighborhood. Close to all public transportation even though we chose to walk 90% of the time. On a street with several outdoor cafes right outside your door. We were greeted promptly by the Habitat representative and our groceries we pre-purchased were there as well. I would highly suggest this service. Apartment was everything we expected for the price and the amount of time we spent in it. Wir fühlten uns sehr wohl im Pedrera. Die Lage ist ideal. Die Fenster könnten dichter sein. Der Straßenlärm stört etwas. Excellent location!!! Very good surroundings, near the city centre (Plaza Catalunya, La Rambla, Casa Milla, Casa Battlo...) Beautiful view from the appartment. Beautiful house with all you need including laudry and kitchen in a safe location near to metro. But a little smelly painting in the house. Habitat comments: Thank you for your kind feedback. We would like to inform you that the apartment has been recently renovated completely. Nice apartment and the best possible situation. Everything you need is inside the walking distance. I will come again but i hope you fix the shower hose. All other perfectly. best regards, Jari Habitat comment: Thank you for your kind feedback, certainly we fix the problem and we are looking forward to welcoming you again. It could be a great place to for 2 adults. Through this appart needs some improvements; first: window should be cleaned up; second: in the bathroom the shower needs a refreshment (water leak on the main floor, the bottle for the soap was broken, no toilet paper); third: the main green lamp in the living room was not lighting. Despite these inconvenients, we received good service from the management when we informed them about the wifi problem Closed to Metro, restaurants and shopping. / Habitat comments: thank you for your review. We have cleaned up the windows and will take a look at the soap dispenser. Apartamento muito bem localizado, com ótima estrutura para casal com dois filhos. Tudo muito limpo e em perfeito funcionamento. Ótima experiência a ser brevemente repetida. we loved this apartment, with its central location, allowing us to walk to all the sights. It has all required amenities, including a washing machine, & everything is modern and good use of space. Our one complaint was that lovely floor to ceiling windows, looking out onto Ramblas Catalunya, were absolutely filthy. We could not see through them, they were so caked with dust and grime.the window shutters were the same. As the view is the best feature why allow filthy windows?///Habitat Apartment comments: We welcome your comments and sorry for the inconvenience in the apartment windows. We'll talk to the housekeeping staff for resolution. Piso muy bonito, muy bien ubicado y bien equipado. Mucho espacio y piso acogedor. Tuvimos problemas con la electricidad pero todo se solucionó rápido gracias al portero, muy amable y muy eficaz. El centro de la ciudad queda cerca y hay paradas de metro no muy lejos del edificio. Puedes ir a cualquier parte de la ciudad (playa, Camp Nou, Montjuic...) sin tardar mucho tiempo y sin tener que hacer muchos cambios. En resumidas cuentas, un piso ideal para poder disfrutar de Barcelona. The Apartment is magnificent. 5-10 min walk from every mail location and 2 main metro station are on the parallel st.
Appartement très spacieux et lumineux, dans un quartier très agréable. Proche du métro Diagonal. A une vingtaine de minutes à pied de la place Catalunya. I was happy with this appartment, it is well situated, equipped and clean. Everything did work well. Muy bien situado. Trato muy amable del personal que nos atendió. Cumplió todas mis expectativas. I had just completed a two week tour with a group the day I move into the apartment. My first words: thank you, God. The place was so pristine, so cozy, so welcoming that after being on the go for two weeks, I thought to myself----perhaps I won't even leave this place. The wall of windows looks out onto a leafy., pedestrian mall on one of the best boulevards in Barcelona. There were sidewalk cafés down there right under my windows. I did go out every day; walked to all the major attractions. Great location. Very comfortable. Great bathroom. I would highly recommend staying here. A very nice apartment for 2-4 people. Great location on Rambla Catalunya, and very close to a number of subway lines and stops for the Tourist and Grey Line buses. The apartment is well equipped with almost everything you would need. The apartment was very pretty, large, and light inside, with interesting photos and artwork. Nice beds! It is located in a convenient area, close to the metro and a great place for breakfast just up the street. Small negative comments: We would have appreciated a small supply of soap in the bathroom. Also, there was a mysterious smell of mildew in the apartment. Maybe the tiles in the shower could use a little bleach. The rest of the apt looked very clean. A/C was great. The Pedera apartment was in a very good location. The response from Habitat was excellent before, during and after our stay. Their customer service is excellent. The beds were very comfortable and there appeared to be plenty of dishes and cooking equipment, although we did not cook there. Really the only serious problem was the state of the floor throughout the apartment. It was filthy. The furniture had seen better days but it was fine and we did not come to Barcelona to sit in the apartment. The apartment has a briljant location , short way to walk almost everywhere. The greeting was excellent as was the location. The Apt was clean and tidy with all the facilities you would need. My only negative comment is that the Furniture was a little disjointed and dated. Pedrera was fantastic-plenty of space to lounge around in, close to plenty of sites and easy walking distance to everything. Everything I needed in Barcelona was provided for -I would definitely recommend to others. Very enjoyable, excellent location, little heater helped a little but was still slightly cold in the room at night. This was our 2nd stay in this apartment which is well furnished, wi-fi works consistently, and the location and views from the windows are terrific. It's definitely a good value for the price. However, the bathroom shower leaks (sometimes worse than others) and is a pain to deal with whilst on holiday. Bed also needs a better mattress pad to stop the 2 twins from separating. Habitat staff are terrific to work with throughout. As per our telephone conversation. The shower was not in good condition and the water spilled out and flooded bathroom. Very difficult to bathe and not have water get out. Had to spend time drying floor. The bottom sheets on the bed did not fit (too small and would come off when you moved. Bed comfortable but sheet problem was very uncomfortable. Would rent the apartment but only with these problems fixed it not I would not. Bathing and sleeping are the most important aspects of a lodging. The Pedrera apartment is very well equipped with everything needed- wifi, washing machine, etc. Everything in the apartment worked fine (though the wifi needed a bit of tinkering by the technician). Fantastic location, lovely spacious apartment with everything you needed. Clean and tidy and nice shower! Perfect for our 6 day stay and will definitely book there again! Very comfortable and well placed. Everything we wanted in an apartment. We loved the Pedrera apartment in Barcelona. it was spacious, clean, right in the heart of a great eating and shopping district, not to mention being only a hundred metres from several of Gaudi's most famous works. The area is busy and interesting but not noisy or crowded. Only one block from the Diagonal metro station which connects to several lines and one block from the fantastic Passeig de Gracia shopping, La Pedrera and the Tapies Foundation. We were even able to walk to the Sagrada Familia and often strolled down to Placa Catalunya and the Bari Gotic district. The Habitat staff were delightful, helpful and quick to solve our problem connecting to the WiFi. We would definitely rent this apartment again. The apartment was almost perfect. We were very pleased with the size, quality and above all the location. There were only two things wrong with the place really; the shower head was broken so the water came out of all sides so we had to temporarily remove it when showering and use the hose. Also the ad stated that there was a balcony, I don't know if that is the Spanish interpretation of a balcony but it really isn't a balcony, just a large window. Otherwise it was perfect, fab location! Wonderful location, great space, safe and secure building. Close to everything that Barcelona has to offer. Apartment can use some freshening up (paint job, need new shower head and steam iron), but overall great value for the money. Very pleasant and responsive Habitat personnel. My husband and I loved this apartment. The location was great, it was the perfect size and we were thankful for internet service. Le service d'Habitat est impeccable et fiable. Ça fait deux fois que je loue des appartements très agréables, bien fournis et propres. Je recommande. The location of the apartment is fantastic, that is why i would stay here again. I think that its not enough with one towel each for a stay over 4 days. Specially if you go to the beach and so. Maybe there is a extra charge for more towels and i will have to look into that for next time. But all in all, we loved our stay! We really enjoyed our stay. Very, very well located apartment. We would recommend it without any doubt. As a plus, we would suggest a wider TV screen and access to Int'l channels; Wi-Fi would also be an interested thing to consider (all of this, even if we don't spend much time in the apartment. It's nice to have when you need it). Pedrera apartment is like having the best seat in a theater. You can sit at the window drinking cava and watching people strolling along Rambla del Catalunya. It's furnished appropriately and with taste. Kitchen equipment could be better but with all the bars and restaurants right around the corner we did not need it. Next time in Barcelona we will definitely choose for this very apartment again. Apartment is in a great location and well furnished. Kitchen is very well equipped for cooking or even a quick snack. Whilst the apartment was quite clean, the tile floor and the orange plastic furniture could use a deep cleaning. The TV doesn't have English-language channels as advertised (not that you'll want to watch TV with the great people watching outside). We already changed it on our website. Good grocery store, Bon Preu, on C. Rosselló, 168 and terrific pastry/tea shop at Mauri on Rambla de Catalunya, 102. It was very nice,clean,close to all u need ,close to main atractions. Wonderful apartment. Very nicely decorated in a modern style. Shower was therapeutic after a day of walking all over Barcelona. Kitchen had most everything necessary. The view from the front wall of windows was incomparable. It was our "t.v." for the 5 nights we were there. We would love to come back soon. el apartamento es excelente.. super bien ubicado..completo y aseado. El area es super nice. Wonderful location, safe, close to Diagonal underground station, good restaurants. Just needs a couple of English speaking TV statons. Location is great - safe and close to metro, sites, restaurants, and shops. Beds including the sofa beds are comfortable. A/C worked great and was a relief since the weather was warm. One suggestion: It would have been helpful to have some information available about nearby grocery stores: the Bon Preu on Carrer del Rossello and the small store on Carrer de Mallorca at Ptge. Domingo. Very good location with lots of shops and restaurants nearby. Spacious apartment. Good services except the tv which is a but small for the size of the living room and few channels in English. However good value for money. A good apartment in a good quarter. This is exactly what I want. Thanks. Great location. Close to the subway and Gaudi sights. The apartment was very roomy and quiet, even with the restaurant outside. Only negative is the floor seemed dirty and needed mopping. Overall, had a great stay. Yes, we certainly did enjoy ourselves in Barcelona! The Pedrera apartment was lovely. Very spacious, light and quiet - just what you need for a relaxing break. We are thinking of coming back to Barcelona with a couple of friends in September! We had a fantastic stay. Everything we needed was provided, and the location was excellent. We will definitely stay at Pedreras apartments if we come to Barcelona again. Thanks very much! Our stay at the Pedrera Apartment was very comfortable. We felt very safe in the neighborhood, and the locked door at the street entrance gave us the feeling of added security. It was bright, spacious and airy inside the apartment. The kitchen was well equipped and had all the appliances that we needed for our stay. Shower and toilet functioned well, the bath towels were clean and soft. The sofa bed was very comfortable, and sheets were crisp and clean. We enjoyed having CNN available on the TV and the small music system was great to use as well. Overall, the location, layout and spaciousness of the apartment would guarantee a repeat stay if I visit Barcelona again. I have no hesitation in recommending this great apartment to fellow travellers, and I found my contact Julie, at Habitat, very responsive, clear and helpful. My friend and I had a wonderful 7 days in Barcelona, and the comforts of the Pedrera Apartment played a large part in our enjoyment of the city. We have the best of our experiences renting the "Pedrera Apartment"! We had already rent other holiday apartments in other cities but this one was really special! The apartment is perfect, modern and at the same time very warm, we feel very well when arriving at the apartment from our tours in Barcelona, it was like if it make part of the tour:) with the exceptional location , the view, the comfort, it was perfect for us, our little kid (4 years old) loved it bacause it was very spacious and colorful, he really wanted to live there, we have a great time in this lovelly apartment! I recommend it to everyone that wants to know Barcelona- you will be in a paralel to Passeig Gracia with lovely architecture, where you can visit. La Pedrera and other examples of Gaudi's buildings or take a little walk by night along this amazing street all illuminated, it's really amazing and can go by walk from the apartment! 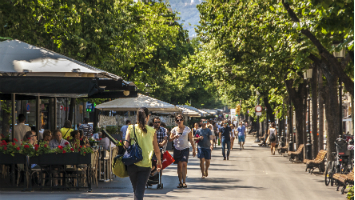 We were 5 min walk from Plaça Catalünia, the meeting point of everything, shopping areas, entertainment, bars & restaurants of all kind, cultural points, transports, everything from Plaça de Catalünia! Don't forget to meet Barcelona, it's a city that inspired us and is very friendly. Barcelona is a city that call us to live there, it will be a place of reference for me that I will visit her again and again when I have some free time...I'm sure I will rent with Habitat Apartments again because it wasn't possible to do so many things in 3 days if we don't stay so well accommodate! Thank you very much for your kind attention with us. We really enjoyed our stay in Barcelona. The apartment was beautiful, spotlessly clean, well equipped and in a great location. We would definitely recommend the apartment to our friends or anyone who wants a modern, centrally located base in Barcelona. We very much enjoyed our stay in Pedrera Apartment on 15-18 May. We found it to be clean and spacious and very quiet considering its wonderful central location. The apartment is very well equipped and it was nice to have the concierge available in the reception area during the day time, he was a lovely helpful gentleman. We would most definitely return to this apartment on any future visit and also recommend it to our friends. Thank you to Habitat for a reliable and efficient service. RECENTLY REFURNISHED! An exclusive Barcelona accommodation located on Rambla Catalunya, in one of Barcelona’s nicest and most vibrant neighborhoods. A stone's throw from La Pedrera, Gaudi’s famous creation for the wealthy Milà family.